Learn about which mixes should be used for stamping, staining, and overlays. Just what is mix design? The American Concrete Institute doesn't even use the term, preferring mix proportioning, but mix design is really more than simply coming up with the proportions of each mix constituent. It is everything that makes the concrete work well for your application: What slump do you need? What strength? Do you need entrained air? What happens if the day is particularly cold or hot? What size of aggregate is best? Should you ask for fly ash in the mix? When most contractors think about concrete mix design—if they think about it at all—the first thing that comes to mind is "bags" or "sacks." In the old days, when most concrete was mixed on site, cement was purchased in bags. A bag is 94 pounds of cement, or about 1 cubic foot; but if you order a 6-sack mix, all that tells you is how much portland cement is in the mix. That mix could be completely wrong for your application and could even be inferior concrete. Rather than only specifying how much cement is in the mix, we should be considering things like permeability, shrinkage, workability, pumpability, stampability, and stainability. The right concrete mix ratio can solve problems and the wrong mix can create them. ACI 211.1 notes that the "selection of concrete proportions involves a balance between economy and requirements for placeability, strength, durability, density, and appearance." Finding the right balance to achieve all these requirements comes mainly from experience. Placeability is an important attribute of a good mix design. Atlanta Brick & Concrete, Atlanta, GA.
Placeability is simply the traits that the wet or plastic concrete has that allow it to be placed and finished. Placeability includes a mix that doesn't segregate but that can be consolidated. The ability to be pumped is another consideration. The classic way to measure placeability is slump, although two different mixes can have the same slump and behave very differently depending on the aggregates, the air content, and the admixtures. Strength is nearly always specified for a concrete mix. The International Residential Code, for example, specifies that interior slabs have a minimum compressive strength of 2500 psi. In structural concrete applications, strength is indeed critical, since that's what the designer is counting on to hold up the building. 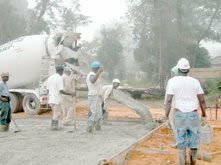 For flatwork, though, strength is seldom the controlling factor, because higher-strength concrete mixes that produce very stiff concrete can result in more shrinkage which shows up as curling and cracking. Long-term durability is at least as important as placeability and strength, but it is sometimes sacrificed if there are compromises to be made. Durability is achieved by getting a low-permeability, low-shrinkage concrete that has the proper amount and distribution of entrained air. Durable concrete must resist freeze-thaw action and prevent chloride from penetrating to the reinforcing steel to contribute to corrosion. Appearance issues are obviously more important for decorative concrete than other applications. Nothing sours a client more than a beautiful floor that is cracked or spalled, or a decorative wall that is honeycombed. With slabs, shrinkage is the number one concern and lower strength concrete (with less cement paste) will often shrink and curl less. With decorative concrete, surface hardeners will provide a higher strength, more wear resistant and less permeable surface layer, the overall concrete strength can be less. There are three stages in concrete's life that need to be considered when developing the mix: the fresh concrete, the newly completed concrete, and everything after that for the rest of its life. The requirements for good performance in each of these three stages can actually conflict. As we all know, wet, easy-to-place concrete is not likely to be durable concrete. But, if you order the world's most durable concrete and find it impossible to place, then that's no good either. Properly proportioned mixes will remain beautiful for many years. Best Stamped Concrete Inc., Huntsville, AL. One way to get the right mix for your application is to have a great relationship with your ready mix supplier. You can then tell him what your application is, when you plan to place, and what the specification requires and he can develop the ideal mix. A program currently being promoted by the National Ready-Mixed Concrete Association called P2P (Prescriptive-to-Performance) takes that concept to the ultimate conclusion—completely relying on the producer to provide the right mix. There's nothing wrong with this if you have a very knowledgeable producer and tell them precisely what you need. But understanding what's going on in the mix is still your responsibility. 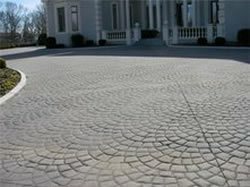 Choose the maximum aggregate size—remember that the larger the better for reducing shrinkage and curling. Estimate the water and air content using ACI 211.1 Table 6.3.3. Adjust for aggregate moisture—wet aggregate can significantly reduce the amount of water to be added. Make trial batches to see what you've got. After all these fancy calculations, the bottom line is that concrete is still designed by experience with previous mixes or by making trial batches in a lab and testing the concrete. Nothing beats experience with a mix. Many decorative contractors will have 4 or 5 mixes that they use for different applications or weather conditions. If you have these mixes already in your ready mix provider's office, he can quickly pull out the design and you can tell him to bring your mix #3 or #5. The standard for designing a concrete mix is ACI 211.1, Proportions for Normal, Heavyweight, and Mass Concrete. Like most ACI committee reports, this document is excellent, albeit highly technical. If you want more detail, written in a more user-friendly way, get a copy of the Portland Cement Association's Design and Control of Concrete Mixtures; that's the bible for concrete mix design. Learn more about the choices in concrete materials. For information on testing fresh concrete, see Air Content and Density (Unit Weight). Ordering Concrete Learn how to order the right concrete, in the right quantity, and delivered at the right time. Concrete Admixtures Learn about the common types of admixtures for concrete and the applications for each type to help you control set time. Ready Mixed Concrete Buyer's Guide Here you will find a buyers guide for ready mixed concrete.